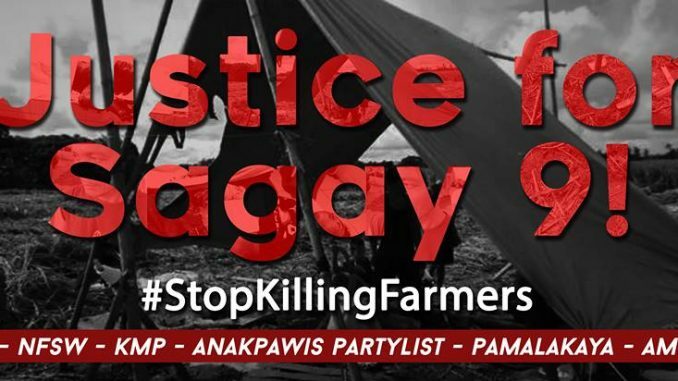 The Unyon ng mga Manggagawa sa Agrikultura (UMA) and the National Federation of Sugar Workers (NFSW) are demanding justice for the Hacienda Luisita (HL) and Sagay 9 Massacres. According to John Milton Lozande, secretary general of both of the above organizations, no one has been arrested, put to trial and punished for the bloodshed that killed seven sugar workers on November 16, 2004. In Sagay, nine members of the NFSW were killed by suspected Special Civilian Auxiliary Army (SCAA) elements on October 20, 2018. Incidentally according to Mr. Lozande, the Philippine National Police (PNP) theories on the HL and Sagay massacres are nearly identical. In the HL massacre, the PNP claimed that the “initial burst of gunfire, single shots in succession, came from the ranks of the striking workers after they crossed the gate and invaded the CAT (Central Azucarera de Tarlac) compound”. In addition to this, the PNP also stated that “Evidence gathered confirmed the presence and participation of the New People’s Army (NPA), but “the evidence will not suffice for their criminal prosecution”. In the Sagay 9 massacre, the PNP also blamed the NPA for the killings as part of its Red October plot in order to put the blame on the Duterte regime. Going back to the HL massacre, the National Bureau of Investigation’s (NBI) report made in 2005 revealed that statements coming from the protesters were more consistent and believable than the sworn statements of police, military and Department of Labor and Employment personnel. The NBI is under the Department of Justice (DOJ). DOJ Secretary Mernando Guevarra recently stated that their probe on the Sagay 9 massacre would be evidenced based and that supposedly he has no pre-conceived notions as to who has done this. This still has to be seen, as even President Duterte has already pre-judged the case by agreeing to the findings of the PNP and military version of the carnage. What is even more alarming is that on November 6, 2018, Atty. Benjamin Ramos, who assisted in the Sagay 9 case was he, himself slain. And the PNP, which President Duterte parroted continue to malign why he was killed. Other than that, a number of leaders of the NFSW, Kilusang Mayo Uno (KMU), and Karapatan Negros received death threats and a reign of impunity reigns in Negros Island, which is the bastion of landlordism in the country. While in Hacienda Luisita, the military is still very active up to now in intimidating its mostly sugar workers and peasant residents. The unresolved Hacienda Luisita massacre and Duterte and his militarist minions in the AFP-PNP’s stance on the Sagay 9 massacre only show that no government from then up to now have no desire to solve the agrarian and labor problems besetting the country, which are the causes of both massacres. It is up to the sugar workers in HL and Negros and their allies both nationally and internationally to obtain justice through their concerted and militant actions in struggling for their national and democratic rights.